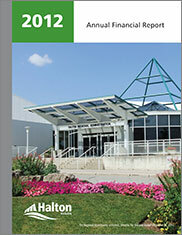 Halton Region’s 2012 Annual Financial Report is now available online. The report includes financial statements, progress measures and key accomplishments. In 2012, Halton’s operating budget for Regional programs and services was $602.5 million and $129.9 million for Regional police services. The report details Halton’s financial picture over 2012, and demonstrates why Halton has achieved the highest credit rating available, AAA, for 22 consecutive years. A recent survey found that 97 per cent of residents are satisfied with the overall services provided by Halton Region and 98 per cent rate the quality of life in Halton as very high. We are committed to maintaining these high levels of satisfaction and continuing to deliver services in a cost-effective and efficient manner. Preparing a sound budget with solid financial planning is a cornerstone to Halton’s high quality of life and a key priority for Regional Council. A commitment to high quality customer service and value for your tax dollars is integral to our budget planning process. Halton is a growing community and, due to solid financial management, we have been able to maintain service levels with no tax increase for Regional services for seven years, one of the best records in Canada. For more information on Halton’s budget, watch my video on the 2013 Budget and Business Plan. To read more about Halton’s Citizens’ Priorities Action Plan accomplishments, visit www.halton.ca/actionplan. Over the last few months, Halton staff and Regional Council have been working on our 2013 Budget and Business Plan. I am pleased to announce that on December 12 Council unanimously passed the budget, delivering a zero per cent tax increase for Regional programs and services. This brings the seven-year average tax increase to zero per cent for Regional services, while maintaining service levels in a growing community and compensating for provincial funding shortfalls. New waste diversion programs including a three bag garbage bag limit and expansion of the blue box program to include additional recyclable materials to increase our diversion rate toward 65% and to extend the life of the landfill site resulting in long-term savings of $15 million to future taxpayers. Increased investment in the Region’s water and wastewater maintenance program ($3.1 million) and state-of-good-repair capital program ($8.7 million) to ensure the existing infrastructure is appropriately maintained to provide service to the residents of Halton. New Assisted and Affordable Housing Units as identified in the Comprehensive Housing Strategy. 10.4 paramedics to staff two 12-hour ambulances in the Region to ensure wait-times for ambulance services continue to meet standards. An additional 100 child care fee subsidies for low income families and additional special needs services for 20 children. If you’d like to find more information about Halton’s 2013 Budget, you can go to www.halton.ca/budget or dial 311. Last week, I had the pleasure of attending an Oakville Chamber of Commerce event to provide an update on the State of the Region. I am always honoured to be given the opportunity to speak with residents and business leaders, and to share the many successes and opportunities that are before us. A 98% resident satisfaction rating with services provided by the Region, which is a significant 22% higher than the average across Ontario. I also had the opportunity to share Halton’s response to some of the challenges that face us as we progress. Regional Council continues to concentrate significant effort to advocate to other levels of government on behalf of residents. In 2007, Regional Council endorsed the Fairness for Halton campaign. The campaign advocated to the Provincial government to address an $8.6 billion dollar shortfall in services and infrastructure funding to support Provincially-mandated growth in Halton. This campaign continues to be an important pillar of Regional Council. Existing property taxpayers should not bear the burden of new growth. Growth must pay for itself. And other levels of government need to pay for their mandated services, instead of shifting the burden to the property tax roll. The Province responded by eliminating GTA pooling, saving Halton taxpayers $124 million dollars, and allowing us to reinvest this money in important and timely infrastructure projects, and the social services needed in a growing community. Council also continues to work with the community and advocate to the Province against a proposed Provincial Niagara-GTA Corridor highway, a highway that would cut through the Niagara Escarpment. Halton Region successfully advocated to the Province against the Niagara-GTA Corridor highway, and on July 26, 2011 the Minister of Transportation confirmed that the Niagara to GTA corridor will not proceed as planned. But the efforts have not stopped. I recently met with the Minister of Transportation to ensure that Halton’s strong opposition to this highway remains top of mind. In Halton, we have more important infrastructure needs, and Council and staff continue to focus our attention on these needs through our Building a Better Halton infrastructure plan. Council realizes that quality infrastructure is vitally important to quality of life. That is why Halton Region will invest more than $1 billion in water, wastewater and transportation infrastructure across the Region over the next five years, with $615 million of that going to improving the Regional transportation network. Additionally, Regional Council also approved the acceleration of certain planned road improvements by up to eight years in order to reduce traffic congestion on regional roads within Halton. So, have our efforts to maintain and improve upon an already high quality of life been successful? Business leaders indicate that they have, coining Halton as a hotspot for business. More and more businesses, like Target, Siemens, Lowes Canada and UPS are choosing to call Halton home. Combined, the four companies will bring more than 2000 jobs to the Region. Noted inventor and businessman Thomas Edison once said, “Everything comes to him who hustles while he waits.” Although we have had many successes, Regional Council takes to heart the fact that we can always improve upon an already wonderful quality of life, and continue to make Halton an even better place to live, work, raise a family and retire, and an ideal location for business investment.